Keith Mitchell spent 8 years as a professional linebacker with the New Orleans Saints, Houston Texans, and Jacksonville Jaguars—until a paralyzing spinal contusion put a sudden end to his career. Having strived since childhood to build a career as a professional athlete, Mitchells was left at a loss as to how to handle the premature end to all his hard work. At the age of just 31, Mitchell was left to reevaluate his goals and search for a new focus and identity. He was faced with the insurmountable task of finding something that would surpass his passion for football—something that initially seemed like an impossible undertaking. Eventually, the discovery of yoga and meditation emerged as a way to help him overcome the physical and emotional trauma of his injury. These two daily practices became vital to his recovery: a way to regain control of his mind and body following injury and traumatic end of his football career. Mitchell began to realize that just as it had helped him, yoga had boundless potential to help others to heal. He set about to find a way to spread the message. Now, 11 years after his life-changing injury, Mitchell is a certified yoga instructor, keen to help others along the path of self-empowerment and healing. His story of recovery and rebirth inspires millions suffering from injury or mental illness to learn how yoga and meditation can help them heal. In order to help spread his message to others, Mitchell has established the non-profit charity foundation ‘Light It Up,’ which particularly aims to help athletes, injured veterans, and obese youth. As one of the main benefits of yoga for athletes is to prevent injury, Mitchell aims to introduce yoga to athletes before they sustain an injury in order to help then to rejuvenate their bodies. For veterans, yoga can help in the recovery from post-traumatic stress and depression, as well as in rehabilitation following physical injury. Daily practice of yoga can help to calm and soothe the mind and body, enabling veterans to calmly readjust to civilian life and reconnect with loved ones. With childhood obesity in America on the rise, introducing children to yoga at a young age can form the foundation of good habits and a healthy lifestyle they can carry into adulthood. Yoga can also help children become more self-aware, and is an excellent way to release anxiety and increase focus. 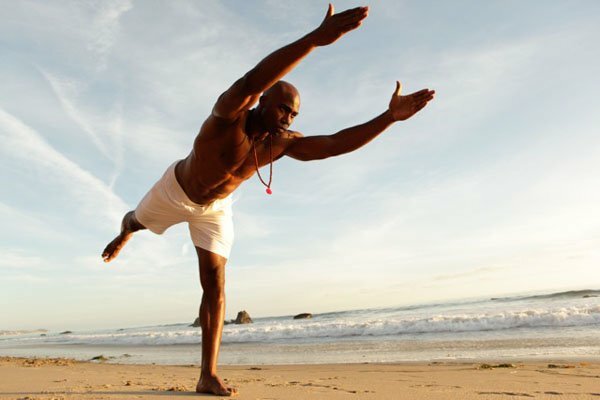 Keith Mitchell’s story helps us to appreciate the healing potential of yoga and meditation for the body as well as the mind. When it seems like everything else is falling apart, yoga can help us to focus on our inner strengths, allowing us to triumph over defeat.